Hello PISO FARE friends! Are you still looking for affordable trips to Batanes, Boracay, or Coron? Well, look no further as Skyjet seat sale 2016- 2017 is ongoing! to what place? Of course, for amazing Batanes, Boracay and Coron! For as low as P4,478 base you can start your journey to one of the top tourist destination, Batanes! 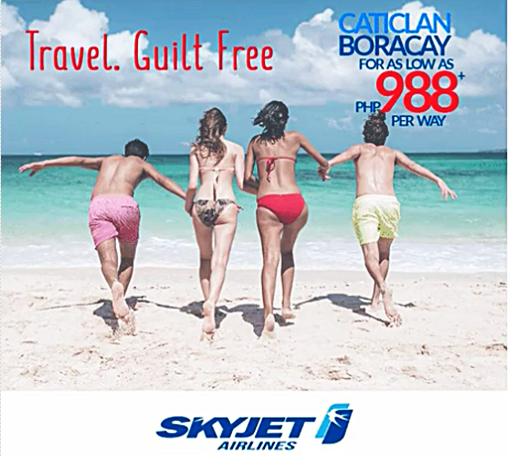 If you think this is not within your budget, how about getting the Skyjet seat sale to Boracay for only P988 base fare or buy your promo ticket to Coron, Palawan at P1,488 base fare per way. The promo selling is ongoing until August 31, 2016. Book your promo flights Fast as Skyjet sale tickets are LIMITED! Skyjet low fares from this promo are valid for travel starting October 1, 2016 until March 31, 2017. Get your Skyjet cheap flights now and fly to these awesome destinations with your family or friends! Skyjet promo ticket is good for one-way travel only and cover the fare and VAT. Other fees and terminal fee are not included yet. Book your Skyjet sale tickets via the airline website: flyskyjetair.com. We shared here a sample booking for Manila to Boracay round trip promo fare. Covered in the Skyjet sale ticket are free 5 kilos hand carry bag and checked baggage of 10 kilos for adults and 5 kilos for children.